I’ve written about potes necklaces before, but I want to revisit the topic. 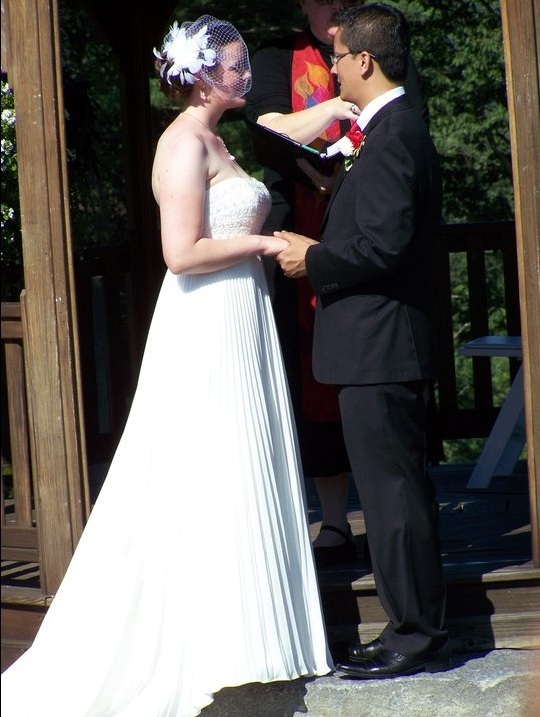 As I noted in the previous post, I occasionally wore potes (pronounced like po-thay) before I got married. P’s aunt, J Phupu, gifted me a necklace in 2008, and 2009, and sent a few more a little after that. 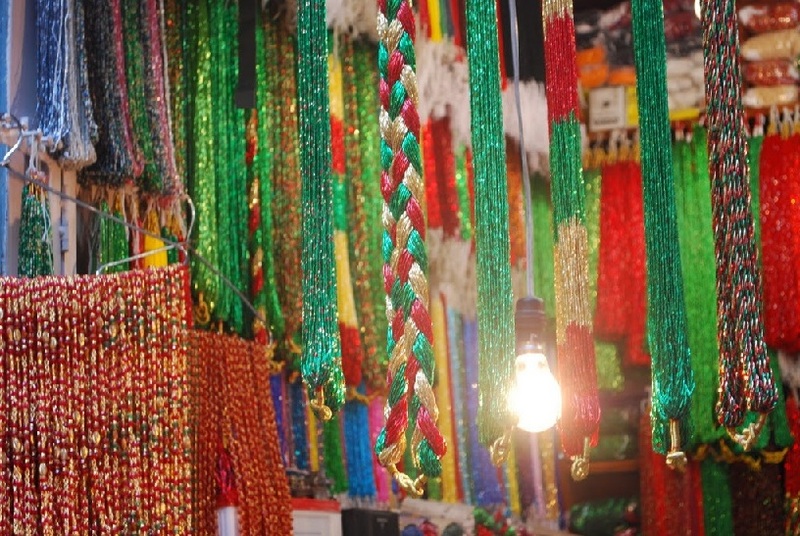 The necklaces were generally short, colorful and multi-strand. I would sometimes match them with a saree if I was going to a South Asian party or dressing up for a cultural event at my work. On even rarer occasions I would wear one to the office to dress up an outfit (this makes me sound particularly fashionable, which I’m definitely not). S-di’s daughters would tease me sometimes saying, “Did you get married?” when I wore them because of their use as a marriage symbol in Nepal. They didn’t really have any special meaning for me at the time, other than a gift from P’s aunt, so I didn’t think it was a big deal to wear them before marriage. The week after we got married I informally wore red clothes (P’s mom didn’t tell me to do this, but I remembered my friend R being encouraged to wear red for a certain number of days after her wedding as a “naya buhari”, and as I was excited to be married I decided to wear red as well). I dressed up my red outfits with the short red, green and gold colored pote necklace that P’s mom brought for me to wear. It’s a nice necklace, but the Nepali wedding colors of red, green and gold remind me so much of Christmas, especially certain combinations and designs with these colors, that wearing red, green and gold jewelry in July seemed kind of “off-season.” (I’m definitely not a “Christmas all year round!” kind of gal). 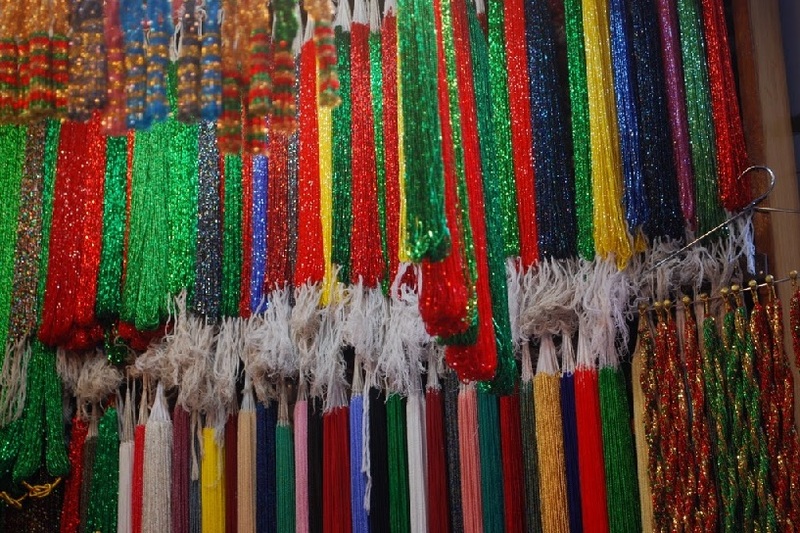 Examples of green, red and gold potes hanging in a pote shop near Thamel. 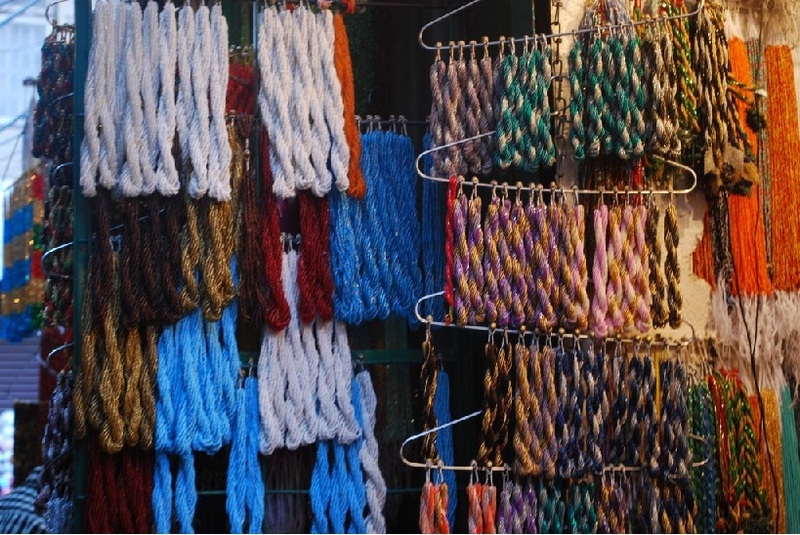 To the left are examples of "thin" potes, and to the right and above are examples of "thick" multi-strand potes. 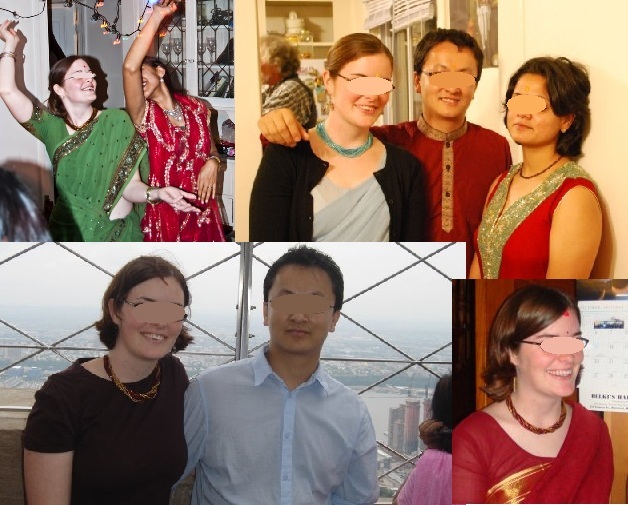 During our second week of marriage I started transitioning into other outfit colors, and picking other potes, but as someone who rarely wore necklaces before, wearing the thick multi-strand short necklaces felt clunky, like I was wearing a tight collar every day. 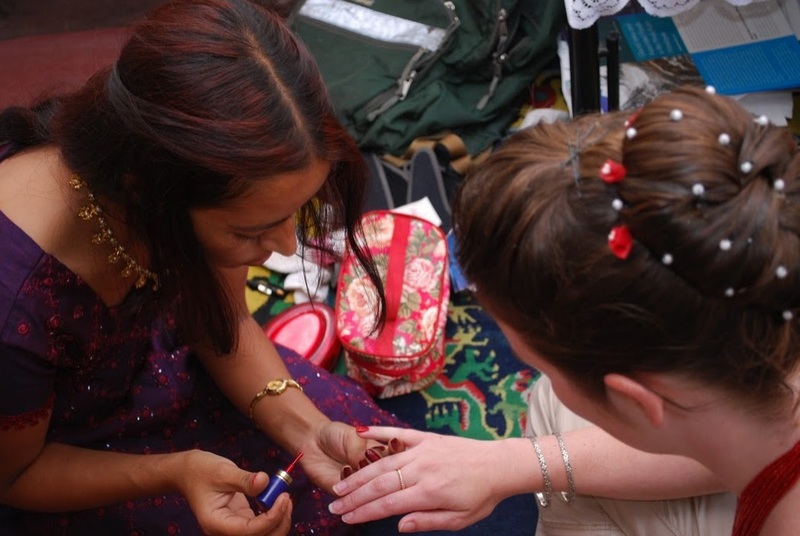 S-di had gifted me a single strand purple and silver pote during Teej 2010, and I started wearing this simpler, single-strand, longer pote on a daily basis, because I could hide it discretely under my shirt if I wanted to, but I still felt that connection of wearing a pote as a married woman. I didn’t expect to wear pote every day. During those first two weeks I did it because I was excited to be married, and thought it was a nice nod to P’s mother’s traditions. I thought eventually I would probably stop. Then Mamu started talking about how my two very close Nepali friends—AS and R—both married to Nepali men, didn’t seem to wear “any signs of marriage.” AS wears a wedding ring every day, which to me is a sign of marriage, and R occasionally wears bangles, but neither wore pote or tikka daily, two signs that Mamu seemed really surprised about. After hearing her talk about this a few times, I figured I would wear pote while she was staying with us, so that she would feel more satisfied that I was showing signs of being married in a Nepali fashion, but I didn’t like wearing the thick short necklaces all the time, and continued wearing the thin purple/silver necklace, even when it didn’t match anything. The next time I visited R I asked her if she had any simple pote, very plain necklaces that I could wear inconspicuously. 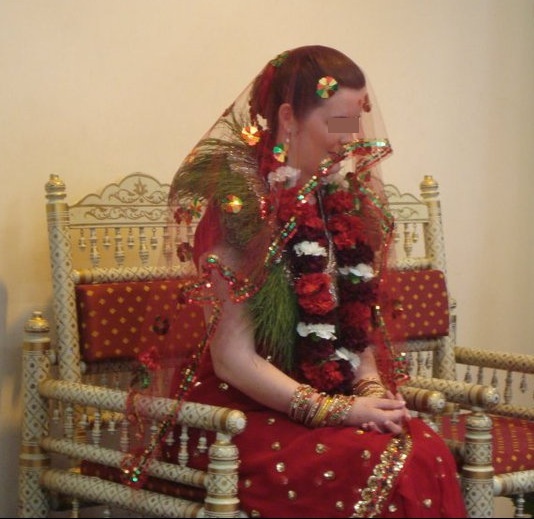 She said that the last time her mother visited she was also concerned that R wasn’t wearing pote as a sign of marriage, and had brought several simple ones for her to wear. She hadn’t made it a habit of wearing them, and said if I wanted to take one or two I could. I picked up two of the plainest necklaces: one that had pale pink and pale clear-yellow beads that basically blended in with my natural skin tone and another that had alternating tiny red and yellow beads that could blend with almost any outfit. Sporting my single-strand red and yellow pote while out and about with P's cousin in KTM. 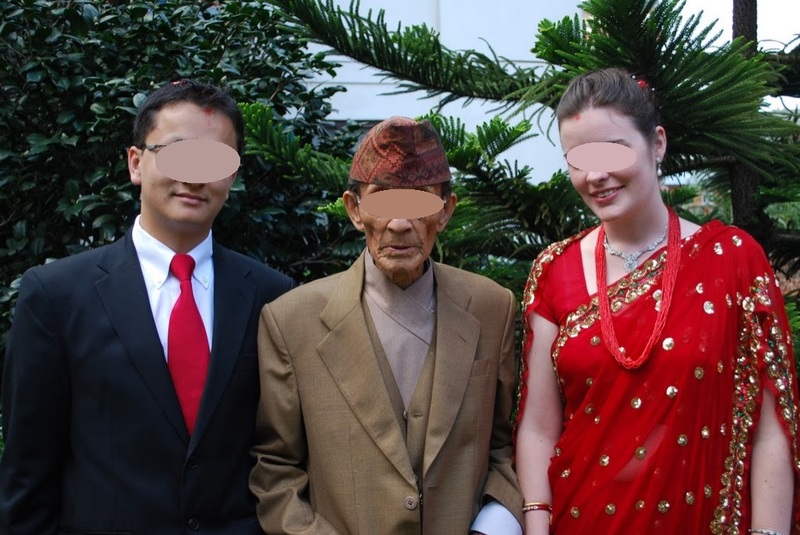 In the US I usually tuck the thin pote under my shirt collar to be more inconspicuous, but in Nepal I felt more compelled to pull it out in the open to show I "belonged" more. With my new simple pote, and the few fancier pote I already had, it was easier to find something to wear every day and it became more of a habit. By the time P’s mom was packing her bags to return home, I was putting the necklaces on without even thinking about it before I headed to work each morning, or slipping one over my head on weekends. While I am in the US I don’t always want to show off the fact that I have on a pote. Most of the people I see don’t know the significance of it, so I wear it more for the significance it holds for me. However when I was in Nepal I found myself wanting to be very overt and intentional in displaying the pote I was wearing. Instead of tucking it under my shirt collar, I was pulling it out and wearing it publically and proudly. 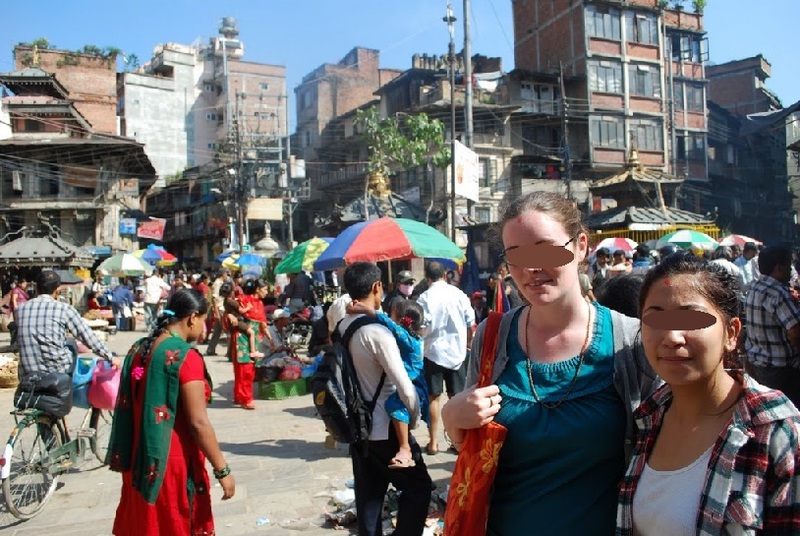 It made me feel like I belonged more—that I wasn’t just a tourist walking in Thamel, but someone married to a local person, someone more deeply involved in the culture. It felt like wearing pote was a statement—yeah, I’m a gori wife, “Mero shriman Nepali ho.” [My husband is Nepali]. Completed multi-strand pote hanging in a pote shop. To the right are shorter styles, to the left are longer styles. Actually, when I departed KTM for home, I was still dressed up for Dashain tikka—in the red and dark blue cotton block print salwaar kameez I bought in Delhi while studying there a few years back, the longer multi-strand shiny red pote bought for the bhoj party, the small red tikka sticker between my eyebrows I wore occasionally on my visit, as well as the giant red tikka and jamara grass from Dashain. I have to admit, I kind of liked the looks and surprised expressions I received at the airport—there are lots of tourists that leave Nepal with a simple red tikka, a kata scarf or a marigold garland draped around their neck, you might even see a tourist dressed in local clothing, but I figured you didn’t normally find a foreigner wearing pote, Dashain tikka and jamara grass unless she was part of a real Nepali family. I just kind of wish I didn’t wear them before marriage so that it would have been a little bit more special. 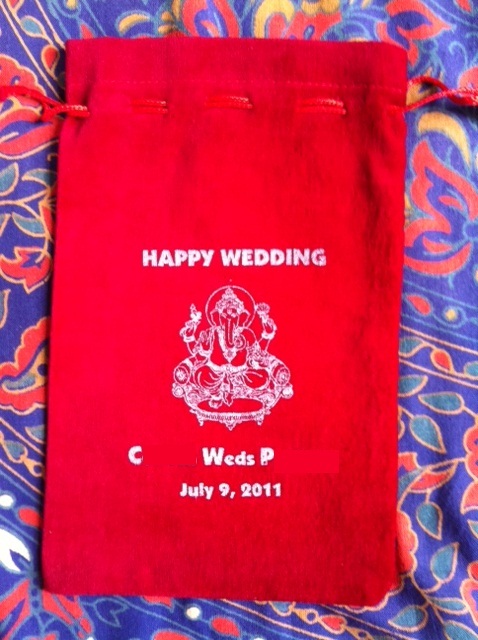 I nearly forgot to mention something very sweet that P’s family did after our wedding weekend. P’s aunt (J Phupu) also couldn’t make it– she was elected to stay back and watch over P’s grandfather while P’s parents were away, and then she tripped in the market and broke her knee right before they left town, so even if she was originally coming, she probably couldn’t make the journey so soon after the accident. 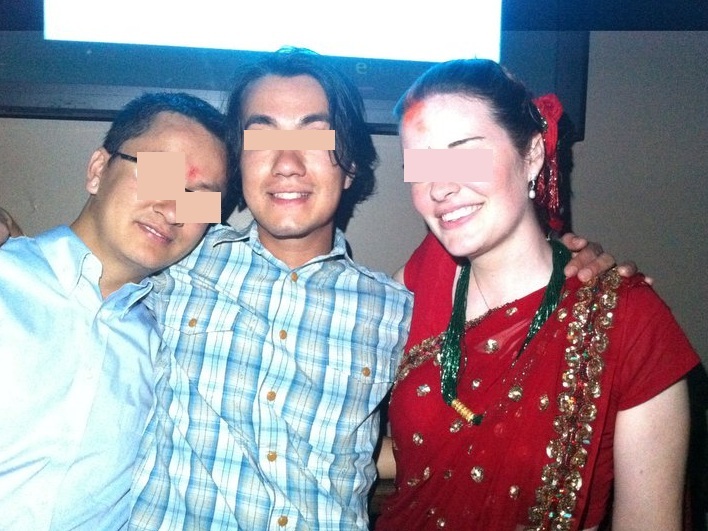 P’s cousin MK (J Phupu’s daughter) is stuck in Nepal waiting for her K-1 fiancee visa to be approved so she can be reunited with her partner MS in the US, so she couldn’t come. And SK (MK’s younger sister) is still in high school and doesn’t have a tourist visa, so she also couldn’t make it either. As much as we would have loved to have all the siblings and immediate family together, having family on the other side of the world makes it difficult to get everyone in the same place at the same time. But we know they were thinking about us over that weekend. 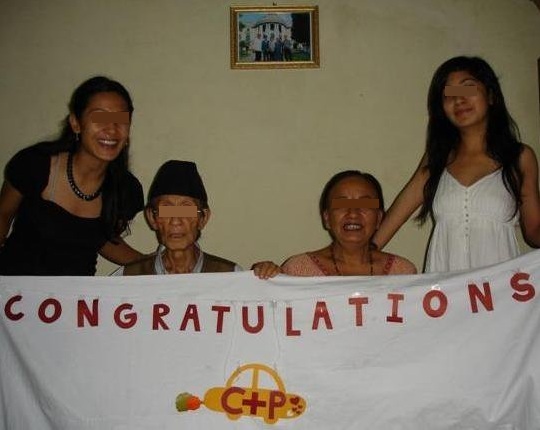 And then they did something so sweet– they posted pictures of themselves on facebook holding up “Congratulations P+C” signs and tagged us in the photos so we would see them celebrating from the other side of the world. 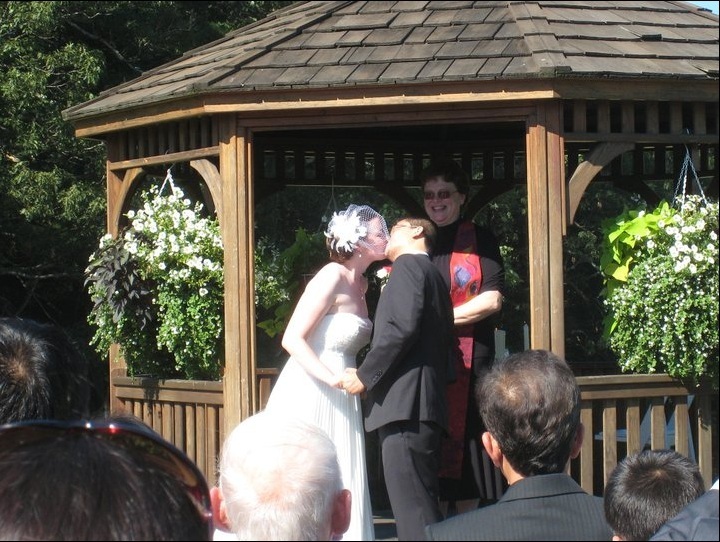 I realize that I have to start writing about our wedding eventually because more stuff that I want to write about keeps happening, and now I have a big blog backlog. I can’t keep bogging myself down with figuring out where to start, so I should just jump right (write) in. 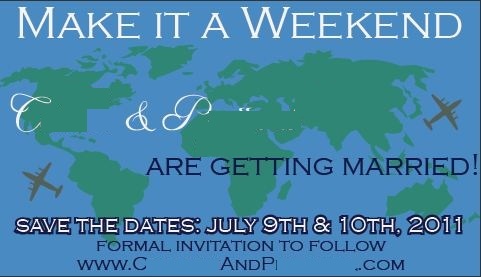 The last pre-wedding post I did was July 6 (Wednesday). July 7th was P’s brother’s birthday. It was also the last day I worked in my office before the wedding. P and I got a lot done before his parents arrived on June 29th, but there were still last minute things to do—planting all my centerpiece pots, making the white wedding programs, stuffing the sagun bags, making the placecards, creating the flower arrangements. And of course I’m a control freak that was giving too much attention to every detail, so I was bad at delegating tasks. 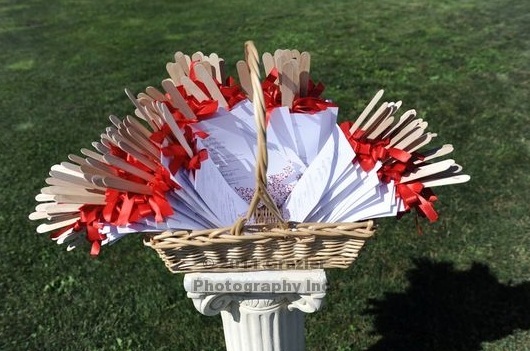 The white wedding program "fans" for the outdoor wedding on a hot sunny day. While I was at work all day, P and his brother were “working from home” with their parents. I felt that it was tough to sneak out once I got home from work because I was gone all day, and the parents expected to spend time with all of us in the evening. I spent many of my lunch breaks racing around the city doing last minute errands, and I would occasionally leave work early but tell P I was working late, so I could have an extra hour to get things done. I kept thinking that a lot of bride’s feel stressed as the “big day” approaches, but they have so much more freedom of movement! What made me feel a bit stressed was not being able to freely run around and do crazy-pre-wedding stuff when I needed to. Although most things were in place by U’s birthday, I still couldn’t 100% relax until I knew that all the pieces for the two ceremonies were in order. My mother and sisters arrived that Thursday afternoon, and I left work a little early with them so that I could help facilitate the C family and P family hanging out together at home. A few years ago I was in the wedding party of a friend who got married on my 25th birthday, so I know what it is like to have a birthday when people are running here and there for their wedding stuff, and how special it was when they remembered, amidst all their organizing and planning, and gave me a cake and sang “Happy Birthday.” So we decided to take U out for a birthday dinner with a few local friends and our two families to give him time to celebrate. Of course, as per my “bad luck” (telephone pole incident, tire exploding incident), as I was driving with my mother and sisters behind P (who was driving with his parents and brother) I passed a crosswalk, and then a cop on the side of the road motioned for me to pull over. I didn’t have a clue why he was pulling me to the side, thinking maybe my sister’s car’s registration had expired or something. “Sir, please! I’m getting married this weekend and we are just on our way…” I nearly wailed. “You say you are getting married this weekend?” The officer asked. “Alright ma’am, enjoy the weekend…” and he let me go. Thank god. But who gets stopped in a “sting operation” for pedestrians crossing the road??? I’ve never even heard of that! And of course, P’s family saw me get pulled over by the cops again. They must think I’m the worst driver on the planet, and that their poor son takes his life in his hands every time he drives with me! I promise I’m not. I may not be the best driver, but my driving certainly doesn’t warrant so many cop interventions in the past two weeks! We had dinner (without any more police officer issues, although I was teased that I shouldn’t be allowed to drive anymore), then went home to have birthday cake. Since P’s mom is a vegetarian who doesn’t eat eggs I had earlier gone searching for an eggless Vegan birthday cake. 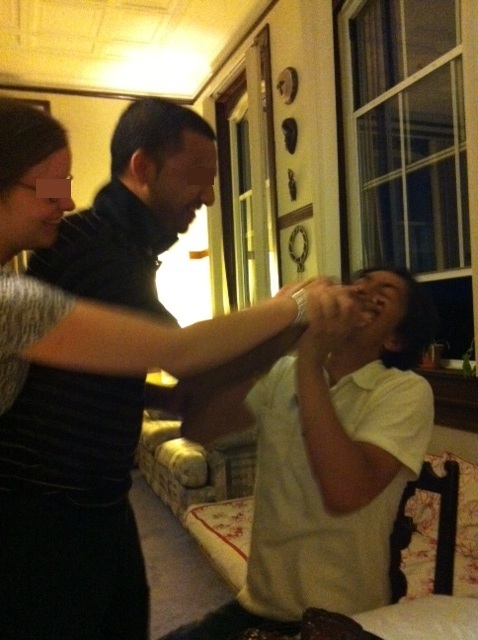 We sang happy birthday to U, and D and I ceremoniously smushed the birthday cake into U’s face. See… I’m a cake smusher, through and through. I’ve had cakes smushed on me, and I’ve smushed cake on others. P knows this, and he was worried that I would smush our wedding cake into his mouth as well. He’d been warning (begging?) me for months not to, and because I love him, I had decided not to, but had to get the cake smushing out of my system at least once that weekend. That Thursday the C family and P family spent the night together—My mom, sisters and I in my bedroom (on an air mattress, and on our bed), P and U were in the living room, and P’s parents were in the guest room. At the close of the night, only one day remained until we had our first wedding. 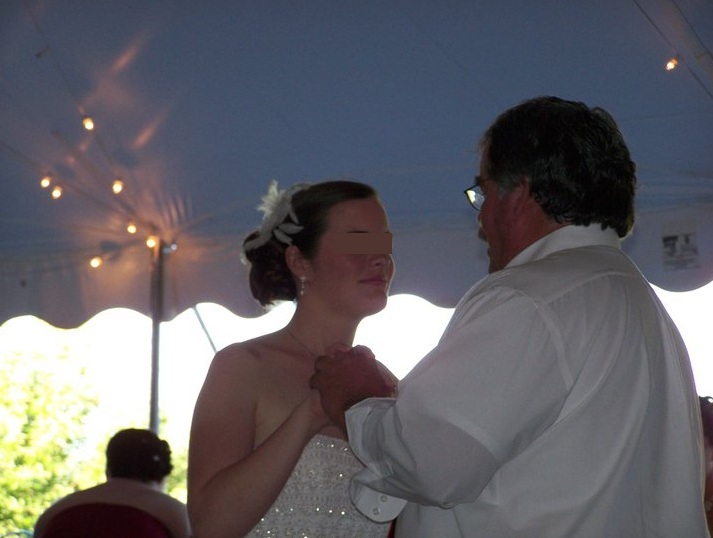 I come from a culture where weddings have programs so that “the audience” will know what to expect. 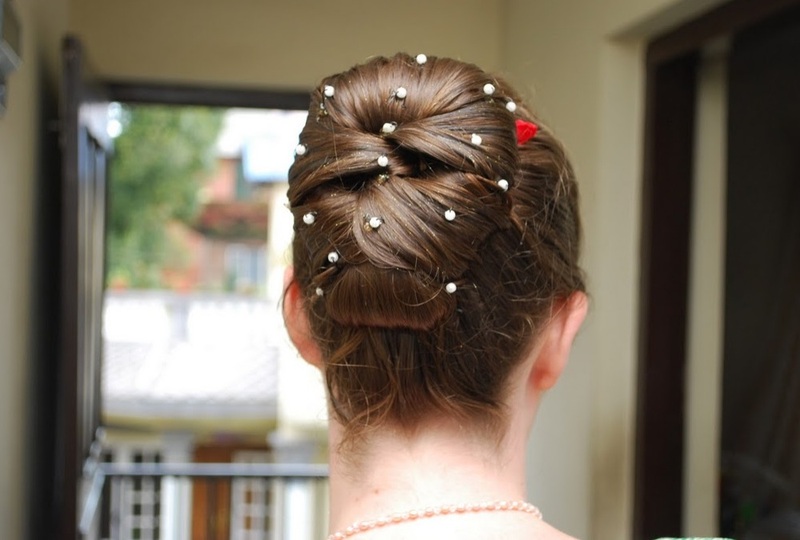 P comes from a culture where weddings follow certain rituals, and although highly formalized, they can (to a Western eye) seem informal and chaotic because people get up and move around, talk during the ceremony, take snack breaks, and there is no formal program that everyone attending has to follow what is happening. 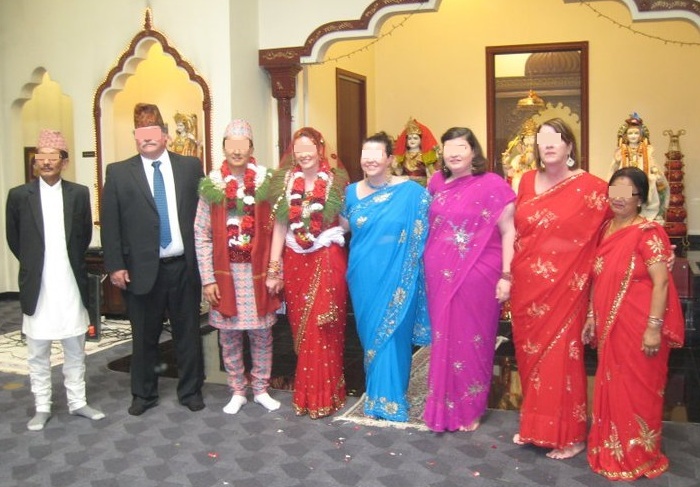 I was pretty adamant from the beginning that I wanted a Nepali program, especially since the ceremony will be in Nepali/Sanskrit, and I feared the non-Nepali speaking guests wouldn’t know what was going on. In my international education mindset of—“Great! A teachable cultural moment!”—I always envisioned a booklet type program with extensive notes on what was happening each step of the way. However I found this more challenging to put together than I initially thought. 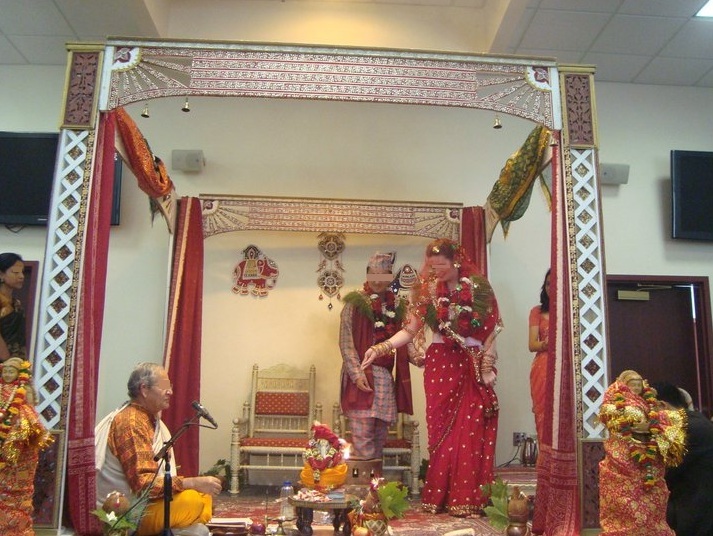 First of all, many of my Nepali friends don’t know what each ritual in a Nepali wedding is called, nor what all the significance is for each thing, or how to explain it. 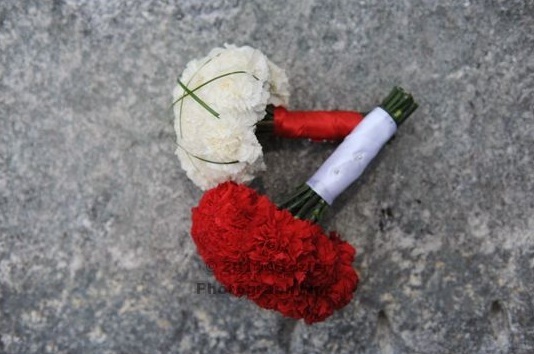 Secondly, weddings can vary greatly from family to family, so it is hard to know what exactly will happen. When I asked the Indian woman helping us organize the Nepali ceremony at the temple, she told me, a) “I could give you a write up” (she never did), b) “you can easily find things online” (we did to some extent), and c) “Americans don’t give us programs explaining every detail in their weddings, why do we always have to do that for ours?” (which I kind of disagree on, I’m sure she would get a program, even if it doesn’t explain all the cultural nuisances). Eventually P and I met with the priest conducting the ceremony and I had P take notes about the order of how everything will happen. I’m a pretty detail oriented person, so it frustrates me when detail oriented conversations take place in Nepali, and I don’t understand. Yes, I’m a bit of a control freak. The weekend before P’s parents arrived I asked him to design the programs (based on a similar design from our wedding invites), so he organized the priest’s notes and did some google searching to give a brief program/explanation of the rituals. 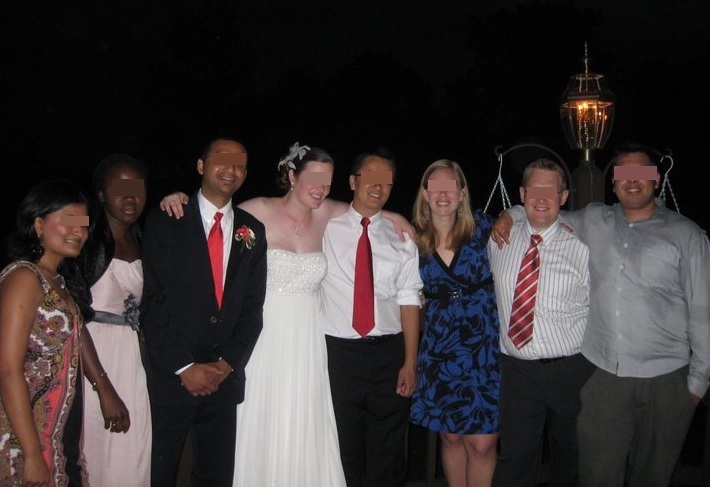 The compromise is that the guests will have the program to keep everyone on the same general page, and a friend will act as an interpreter for certain parts of the wedding to help them follow along if they get a little lost. P and I printed the program, hoping that we had the details right (and the order–we only had P’s notes to fall back on, based on a casual conversation we had with the elderly priest). The first weekend that P’s parents were here we took them to the temple to meet the priest, and he approved the information on the program, so I guess it is set. Before leaving the priest blessed me to have “many sons” (eek). So I thought I’d post our program, so people in the future might have a place to start. 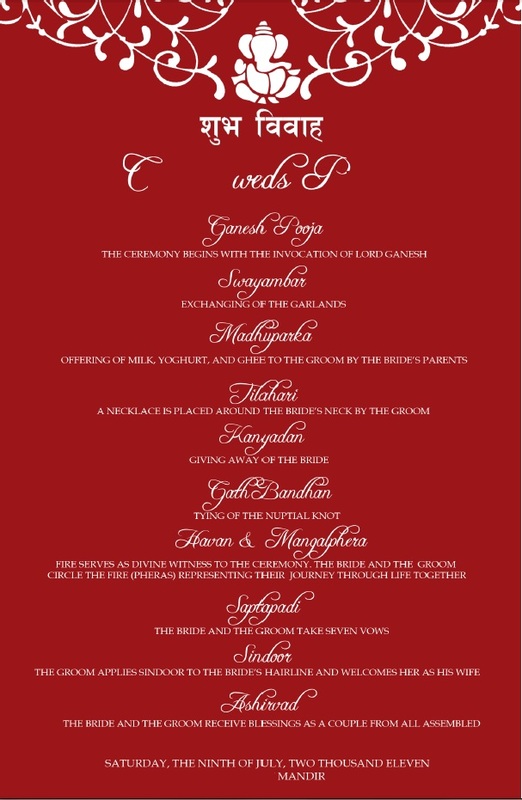 I’m not saying that all Nepali wedding ceremonies follow this order, or only have these rituals (this is certainly a simplified version of what could constitute a marriage ceremony in Nepal), but at least it gives an idea. I guess the only potentially “odd” thing is that P couldn’t find the Nepali word for the ritual called “Madhuparka” (I guess it is more of an Indian term). 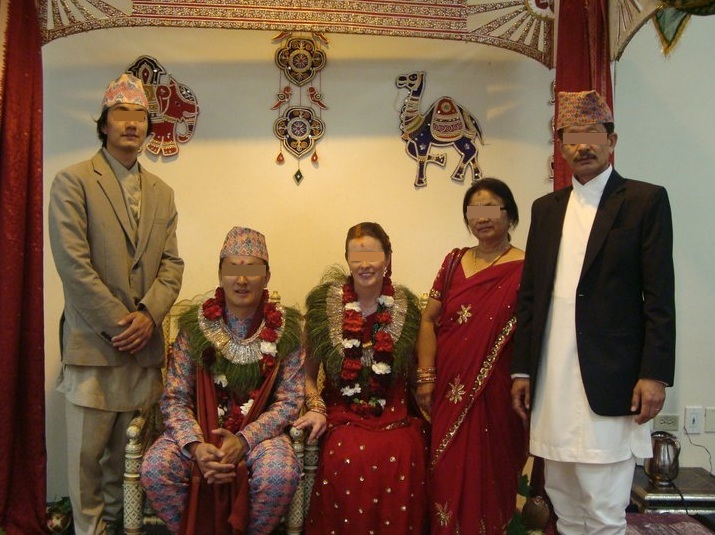 My first “real” Nepali wedding experience was at R and S’s week long ceremony in 2009. 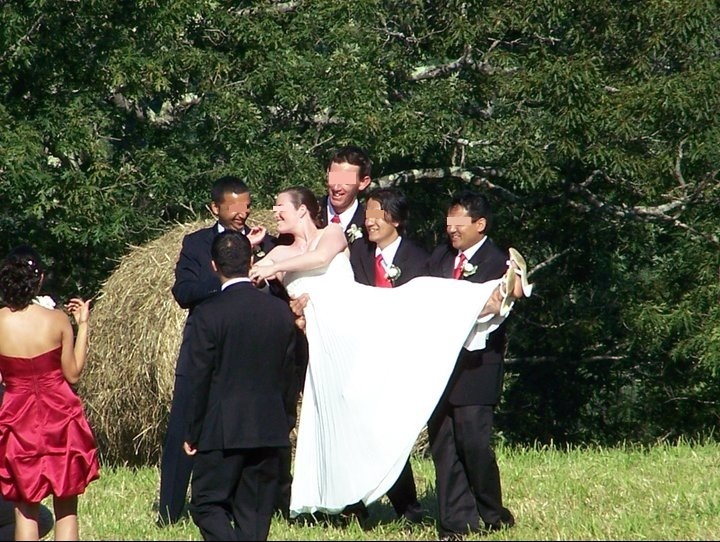 I stored away different ideas that I saw as possibilities for our own wedding down the road. However they are both Newari, and what I didn’t realize at the time was that various rituals and traditions that I was taking note of were often specific to the Newari community in Nepal–and that even within the Newari community there were various “takes” on different traditions (as was evident when R and S would debate their own family’s particular wedding traditions). 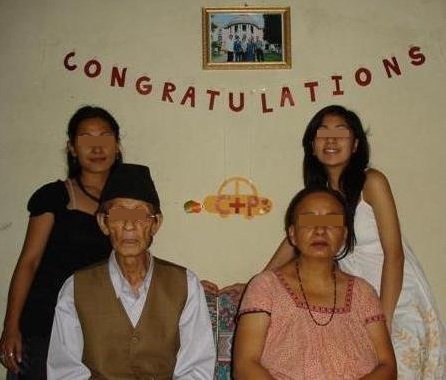 P’s mom is Newari, but P’s dad is Chetri, so generally the culture of a household (if the household in Nepal is blended) tends to be that of the father, so much of P’s family traditions were Chetri instead of Newari growing up. (Conversely, S’s mom is Chetri but dad is Newari, so he grew up with Newari traditions). 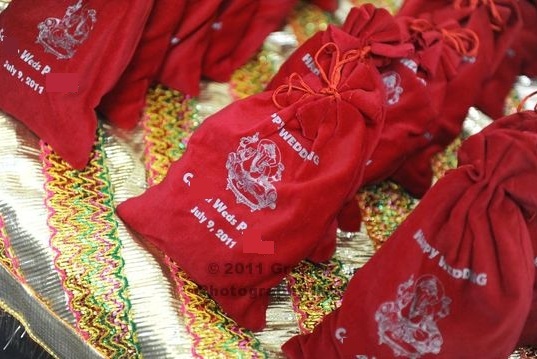 One tradition that I noticed at R and S’s wedding was that R’s family gave guests small red velvet bags with a picture of Ganesh with “R weds S” imprinted on it. Inside was a small packet of nuts, dried fruits, and chocolates. I assumed that this was a universal custom, not necessarily a Newari custom. 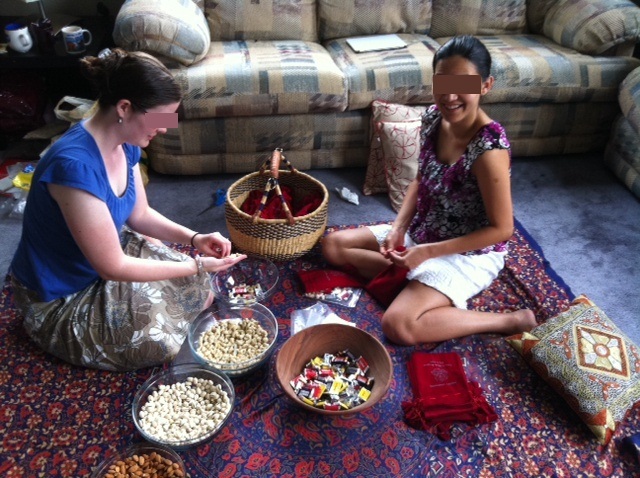 So while budgeting for various aspects of our wedding, I had assumed that we would give small favors at the American wedding (as per our tradition) and that we would give a small bag of nuts and dried fruits at the Nepali wedding as a favor. So we asked, and P’s dad said not to worry about the bags, we didn’t have to do it. Around the time that P was in Nepal (three months ago), P’s dad realized that I had googlechat because P would message me when I was at work (if the power was on in Nepal). P’s dad loves keeping in contact with people, so after P left, he started messaging me nearly everyday to say a quick hello and ask how things were going. 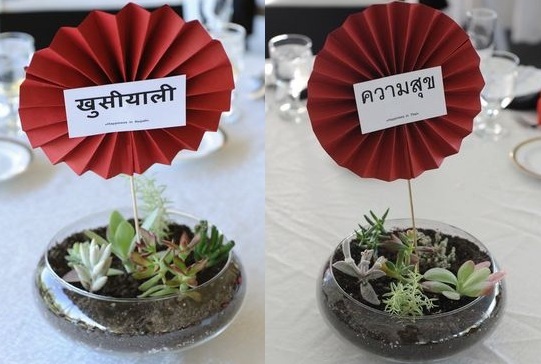 A few weeks ago I mentioned to him that I was going to give out small favors at the American wedding, since that was the tradition, and asked if he wanted to do anything similar for the Nepali wedding. 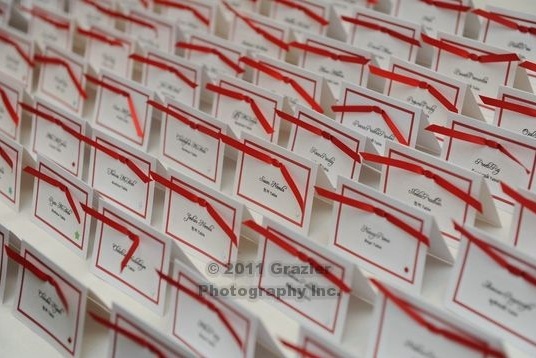 I think when he heard that there were favors for the American wedding, and thought it would be nice to do sagun bags too. So he told me he would talk to Mamu about it. When his parents arrived in the States, they came with a suitcase of food, included several bags of cashews, almonds, pistachios, and 150 red velvet sagun bags. R and S made a surprise visit this weekend (in part because the boys decided to take P out for a bachelor’s party– in true P style–deep sea fishing! That’s where they are as I type) so R offered to help put the sagun bags together. We laid out a sheet, and put the different nuts and chocolates into different bowls for easy access, and R, Mamu and I started filling bags. The first 75 seemed to take a long time (especially when Mamu declared, “No mistake, no mistake” and R and I rushed to keep up with her pace), but later in the evening, after a long break, the last 75 went very quickly. 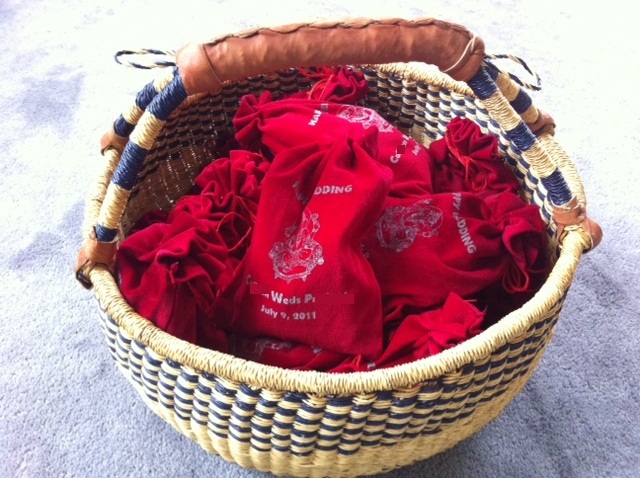 So now we have baskets and bags full of 150 red velvet “C weds P” sagun bags to distribute next Saturday!